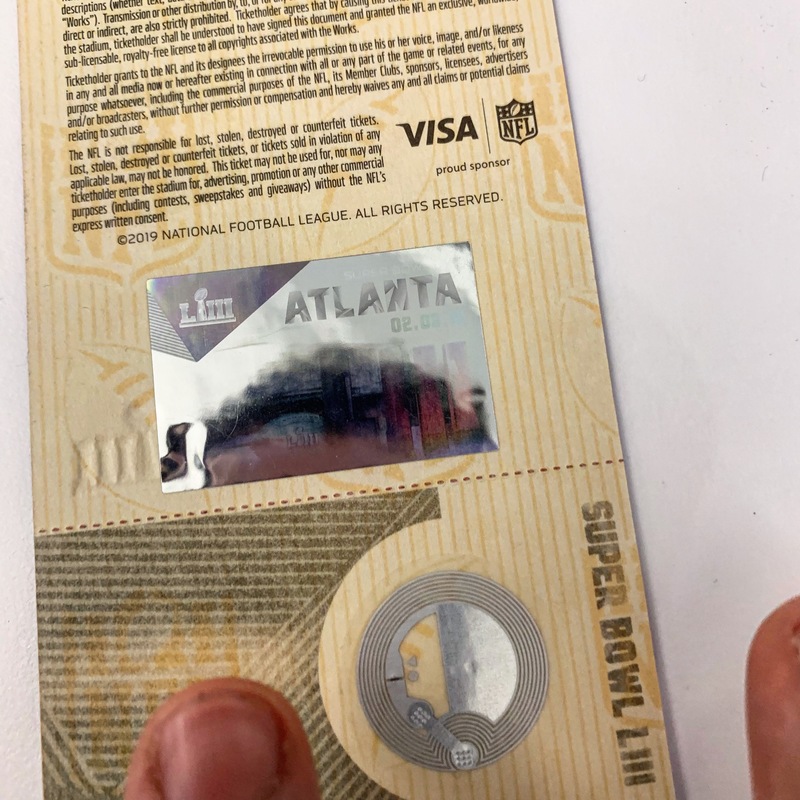 So you’re seriously considering buying tickets to this year’s Super Bowl in Atlanta but are a bit hesitant to secure your tickets from a secondary marketplace or other source due to horror stories you may have read regarding counterfeit tickets. That’s completely fair and we absolutely advise any prospective Super Bowl ticket buyers to do all of the research they can in order to feel comfortable before pulling the trigger on tickets to the big game. Once you’ve committed to the idea and decided to purchase, you’ll want to be familiar with what an official and legitimate Super Bowl ticket should look like. We at TickPick have created this blog with the intention of providing fans out there with a few useful tips on how to ensure the Super Bowl ticket you have is authentic. 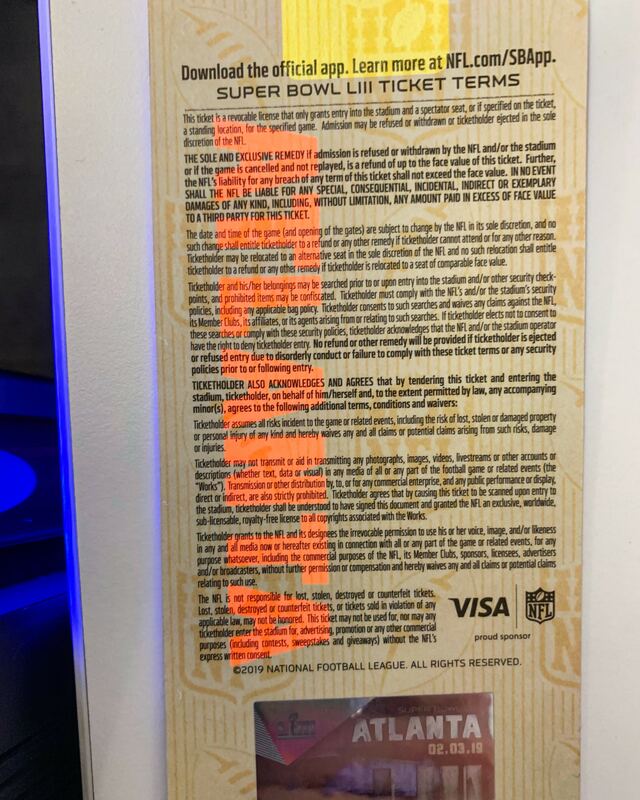 One cool (and necessary these days) feature of legitimate Super Bowl tickets is a hidden message on ALL legitimate tickets for this year’s game that are only visible while a blacklight is shone upon it. 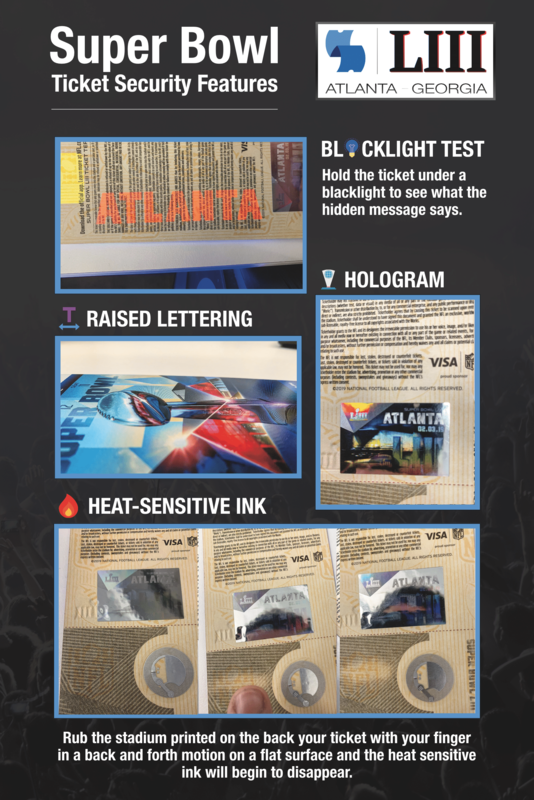 You’ll notice from the graphic provide above that this year’s message reads “ATLANTA.” We at TickPick will have a blacklight demonstration set up at our offical pickup location for this year’s Super Bowl just to let our buyers see this cool feature themselves. While it’s a bit difficult to tell from the picture above, the hologram on the back of the ticket shows a picture of a few things verifying the authenticity of your ticket. One of them depicts a football with with LIII logo and the official LIII logo in the top left corner. Another is the phrase “Super Bowl LIII” with “02.03.19” underneath that line, and a big “LIII” below that. Finally, on the left-hand side of the hologram is a logo that says “Super Bowl” atop “LII” that’s below it and written sideways. 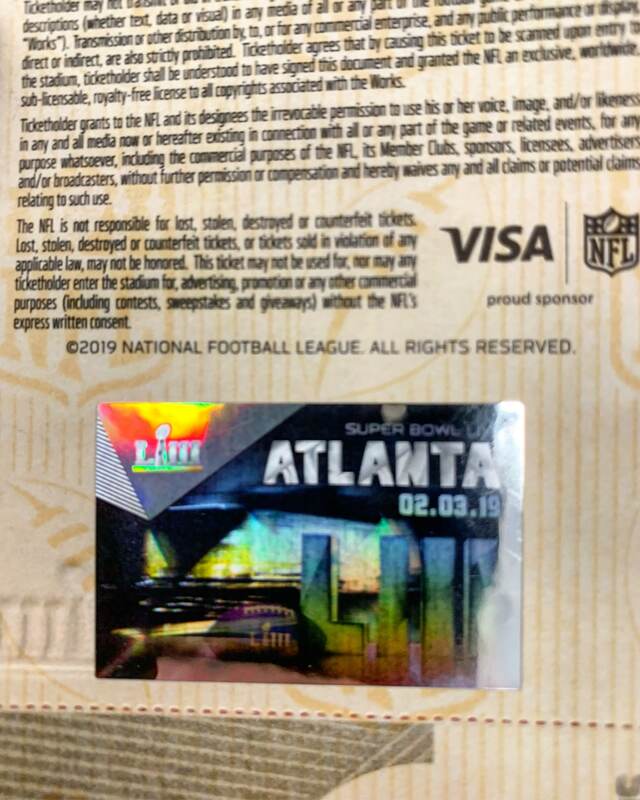 Last but not least, a feature of all legitimate Super Bowl tickets is the heat-sensitive thermal ink used on the bottom of the ticket (below the hologram and perforated line). If you rub your fingers over the ink (creating heat through friction), it should “disappear” for a few moments until it’ll come right back. This may be the hardest thing of all for any fraudsters to duplicate, so we suggest trying it out for yourself just to feel secure. 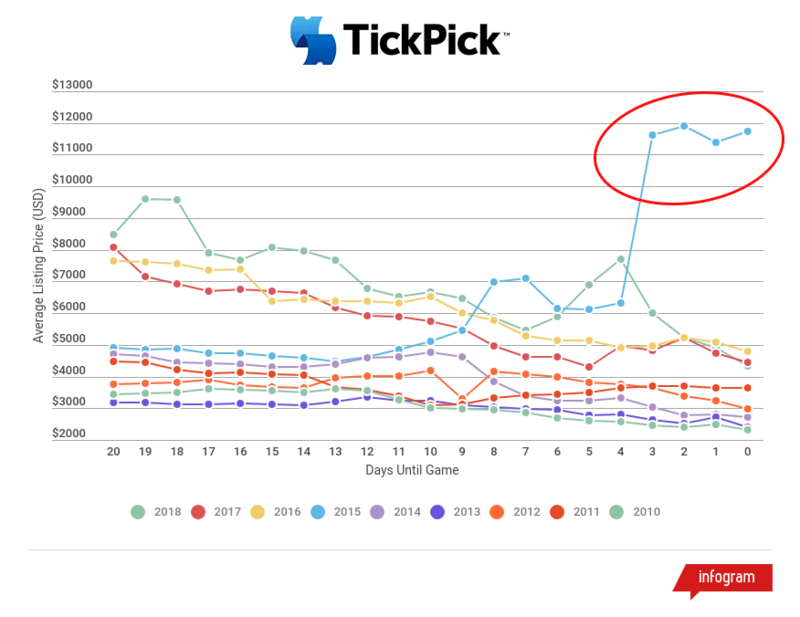 Is TickPick a trustworthy site to buy Super Bowl tickets? Absolutely, and we wouldn’t still be in business if we weren’t. We’ve sold thousands of tickets over the years without ever seeing any issues with their legitimacy. This is due in part to our team of ticket experts who know what to look for when reviewing Super Bowl tickets. Now you can test it out for yourself to ensure you’re going to the Big Game with authentic tickets. You can see the founder of TickPick talk about the company on Bloomberg TV. You can also see all of our press mentions here, as well as some of our Super Bowl buyer reviews here. Above all, if you’re serious about purchasing Super Bowl tickets, we would strongly advise against purchasing tickets from anywhere that isn’t a legitimate ticket site such as TickPick, where you’re offered 100% guarantees that any tickets purchased will be completely legitimate and picked up right from our official pickup location right in the heart of Atlanta. If you’re on the fence, please refer to our guide on buying Super Bowl tickets. Do not buy from a stranger in the parking lot, and do not pay for any tickets through any methods other than a credit or debit card, or PayPal, which protect your purchase and can get you your money back if you’re ordering from a source with whom you may not be familiar. For more information on how to get cheap Super Bowl Tickets or to check out our report on when’s the best time to buy tickets, sign up for our Super Bowl ticket price updates below. Again, you can find the cheapest, no fee Super Bowl tickets on any marketplace for the 2019 Super Bowl here. If you’re serious about buying tickets for this year’s Super Bowl or are even just considering it, please don’t hesitate to email our support staff that’s available seven days a week from 9am-9pm at [email protected] or call our support line at 845-538-4567.